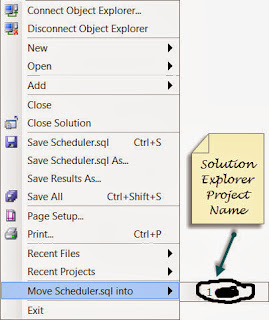 The Purpose of the Move option is to take your current active query file and move it one of your active projects in solution explorer. Once you choose the project the query gets added to the project in solution explorer. One of the nice things about this option is that it allows to quickly place the .sql to the project instead of going to the solution explorer and adding it. I have highlighted the query file after getting placed in the project.